Sharon and I have been planning our 50th birthday celebration New York trip for over a year. It had to be delayed a year when life and other commitments took precedence. I took a lot of pictures of our New York adventure last week and this is one of my favorites. I am not a fan of pictures of myself but I vowed to take a “selfie” of us each day to capture the trip and be reminded long after it passed. 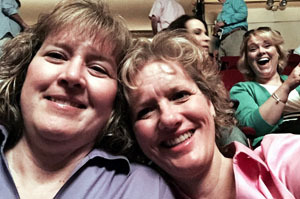 We were at Carnegie Hall for a concert. When I checked it out to make sure my finger didn’t make its way into the picture, I saw the gal in back of us with a big smile – so we got a selfie plus. I turned around and asked her what she was doing in our selfie and we all had a big laugh about it. We saw a lot of girlfriends together on the trip. I’ve known Sharon for over 30 years. We met at freshman orientation at the University of Minnesota. We went around the room for introductions and she said she was from a small town called Canton, South Dakota which probably wasn’t on the map and cracked up at her own joke. I thought – what a nerd. And from that day on that nerd and this nerd have been best friends. During college, when she didn’t go home for Easter, she joined my family’s celebration and quickly became part of the family. My Dad helped her buy her first car. From calculus to Rocky’s pizza lunches to break ups to grocery shopping at midnight after a movie to her and Tim getting married and moving to New Jersey in August, 1989. I remember the moment after we packed the moving truck saying good bye and aching the loss. And then surprising her Thanksgiving that year and flying out to see her. That was the first time I went to New York when we ventured in on the train. Even three decades later when we get together, it’s like time has not passed between the last time we saw each other. The conversation picks up as if only a moment’s silence in between. Time passes quickly and time away with a friend or helping family through health issues are vivid reminders to focus, pay attention and invest ourselves in what’s really important. Call an old friend, check in with a family member, make a new friend. We can’t predict what tomorrow will bring but we can be assured that change will be a main ingredient. Stay in the moment, create new moments and cherish each one as you are moving through them. Be a friend that will still connect 30 years later and laugh and love even deeper. A NYC adventure with a BFF – what could be better! Thank you for visiting my blog. I must say that I enjoy the organic nature of you sharing your life. It inspires me.